The rapid development of commercial buildings and infrastructure requires an intensive use of piling. Like all new developments, there has been considerable time between the development of improved design methodologies and their implementation. 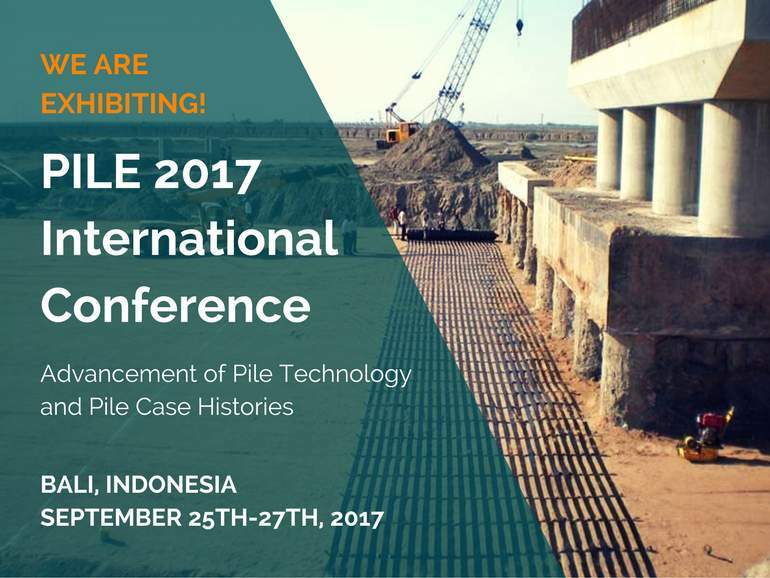 This process can be accelerated by sharing ideas: PILE 2017, is an international conference aiming to fill this gap by presenting “Advancement of Pile Technology and Pile Case Histories”. The conference will take place in Bali, Indonesia from September 25th-27th, 2017, and is organized by the Faculty of Engineering, Parahyangan Catholic University, under the auspices of the Indonesian Geotechnical Society (HATTI), the International Society for Soil Mechanics and Geotechnical Engineering (ISSMGE), the Ministry of Public Works and Public Housing, Government of Indonesia, the Deep Foundation Institute (DFI) and the International Association of Foundation Drilling (ADSC-IAFD). PILE 2017 will present outstanding keynote speakers, presentation of technical papers, pre-conference workshops, post conference technical tours, exhibition, social and networking opportunities for participants and sponsors. We will attend the exhibition with a booth where we will present our ground improvement and transportation infrastructure solutions. Whenever construction is carried out upon soft or unstable ground, the possibility of differential settlement must be taken into account. This settlement can be reduced using high strength geosynthetic geogrids such as our Paralink® geogrids for basal reinforcement. These grids absorb, spread, span and dissipate the applied loads vertically downwards into the ground, or into the piles. Furthermore, by increasing the capability of the soil to “span” or “arch”, a high strength geosynthetic can enable the pile spacing to be increased. Paralink® is available for strengths up to 1350kN/m and has been used for over 30 years for these reinforcement applications. The design of such interventions requires experience and a deep understanding of the performance of geosynthetics. This is why, beyond simply providing materials, we present ourselves as a technical partner, working closely with designers and contractors to understand and fulfil the technical needs of the client, optimizing the solution, design and product. For more information and to arrange a meeting at our booth, please contact us.